Sliced my head open on the rear window of my FC. I'll spare you the pics. Had the window fully extended when I ran around to check something on the drivers side. 17 staples stitched the top of my head back together. Could not believe all the blood. Now, I have a fear of opening any window more than a crack. Wife asked that I post this to help prevent someone else having to suffer same. After one of our trips to Mardi Gras we had so many bead necklesses tossed at us we now hang one from each of the open windows for that reason. most long term owners will show plenty of head scars when they go bald. The ability to follow instructions is highly underrated. Happens to everyone eventually. 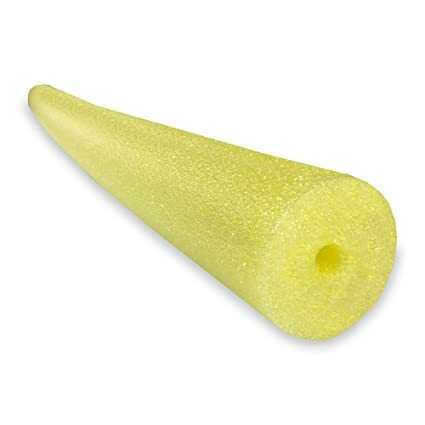 Get some yellow pool noodles and cut them into ~10" lengths, slit each piece length-wise, and stick a piece on each corner of every open window. I've done it many times but always wearing a cap so only minor damage to the noggin! Been there done that on windows and awning poles. We use noodles, flags anything. Last time hubby got his head packed with frozen pea bag and I did the butterfly strips. Not news to many of us....as I painfully know. Common problem. Pool noodles, beads, swirly things etc to hang from them as they are wicked sharp. Never have had the problem on my 89 Excella1000, all of the windows have rounded edges. And here I thought I was the only one! Nice to know I’m not the only one who made the mistake of walking into an open window and cutting the top of head open. Lots of good suggestions here in the replies! Stay safe! There are all sorts of ways to bang your noggin with Airstreams. My "favorite," based solely on frequency, is to get distracted coming in the door and straighten up into the top of the door frame. No, I haven't gotten myself a Cheesehead hat, but sometimes it seems like it might be a good idea. I have to chuckle. At the RV camp we were staying with in TX, a bunch of us guys were standing around talking, about five of us, and someone noticed that every one of us had bump on the head... Of course, most of us were bald so it was easy to see.... awning, window, rear hatch of tow vehicle... we got a good laugh out of it. Someone said we need to compare shins also! nothign is more painful than racking your shin on a trailer hitch ball! I've seen these installed and they make our AS opened windows look even better (and safer for us)!